Randy Rhoads showed how knowledgable he was in classical music which he translates into something incredible, merging it with styles like rock and metal. Just take a listen to Crazy Train to get an idea of how talented he was as a musician. Many guitarists seem to think that playing guitar is all about technicality, or just learning a bunch of songs, but Randy Rhoads took it with a different approach, he treated music as a discipline where he learned it rigorously. Crazy Train went big because Randy Rhoads took the song very seriously – it’s technical as fluck (you know what I mean), and it’s not just about the speed, but the attitude he had playing with the one and only Ozzy Osbourne. Randy surely was all about his phrasing, melody, and technique, and it all went down into one song – he honed it all in Crazy Train. Well, Ozzy, for one thing, was already a legend before playing with Rhoads. He has been since called the godfather of metal, but let’s face it – he became famous as a solo artist because of Randy Rhoads. His voice is unique, got a lot of power, and sometimes surprisingly high in range, and when you combined it with Randy’s guitar playing, then Crazy is what you get like riding in a Train. Everything about the song is quite brilliant, though parents freaked out when they saw the album cover, but that’s what Ozzy’s intent. But when you took the lyrics for what it’s worth, then it’s all very lovely. Ozzy was never afraid to be himself and that’s a sign of him to be extremely intelligent and very talented. 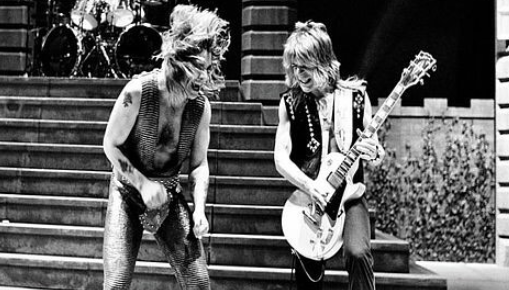 REST IN PEACE RANDY RHOADS, AND ALL HAIL OZZY!